Bill Gates House – Where does Bill Gates Live? Inside Bill Gates House – Where does Bill Gates Live? Bill Gates House: Where does Bill Gates live? He lives in a large mansion in Medina, Washington. 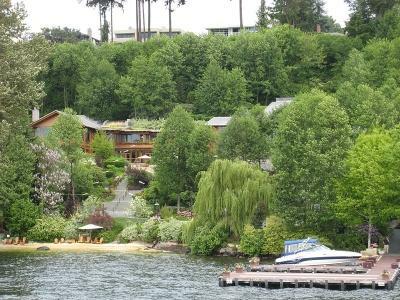 Earth-sheltered, the James Cutler-designed mansion overlooks Lake Washington and costs more than 97 million. The mansion spans more than 66000 square feet, and sits on a 2.1 hectare lot. The lot was purchased in 1988, and construction took more than eight years to complete. You might wonder about some of the features of this mansion: according to property records, they include eight bathrooms, four levels, an underground garage, an estuary, a theater, a gym, a library, a boat house, a guest house, a 5 x 18 metre swimming pool, a fossil-motif floor, an underground music system. Not surprisingly, Bill Gates’ home is also perhaps one of the most high technology homes ever built: rotating paintings, pressure sensitive floors – what less can you expect from the Microsoft founder? Wondering what the Bill Gates mailing address is? Here you go: 1835 73rd Ave NE, Medina, WA 98039.